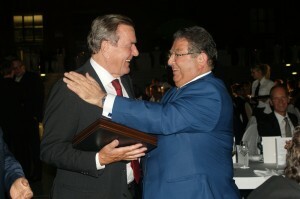 Former Chancellor Gerhard Schröder and Mr. Dara Jaleel Khaleel, President of the Federation of the Kurdistan Chambers of Commerce and Industry (Photo: NuMOV). »The current conflicts in Libya, Syria, Iraq and Palestine, to name but a few, are viewed with great concern in Europe. The instability in the region also threatens peace and prosperity in our continent.« Founded in 1934, NUMOV, the German Near and Middle East Association, is Germany’s oldest and largest non-profit and independent service provider for the Near and Middle East region. »Germany has a special interest in the relationship with the Near and Middle East. As Europe’s largest exporting nation, the focus is on economic exchange. Economic exchange, however, is dependent upon the political stability of the Near and Middle East region. The hopes associated with the Arab Spring have not been realized in many countries of the region. The current conflicts in Libya, Syria, Iraq and Palestine, to name but a few, are viewed with great concern in Europe. The instability in the region also threatens peace and prosperity in our continent. The tangible repercussions can be seen in Europe: The humanitarian tragedy of the unabated influx of tens of thousands of refugees. The central significance of the region for European energy supply. The danger to European societies brought about by the threat of terrorism. Therefore, peace and stability in the Near and Middle East region are in the interests of Europe. The actions of the terrorist group “Islamic State” are a huge challenge for the international community. The displacement of hundreds of thousands of people and the associated human rights violations must be stopped. “Islamic State” poses a threat to the entire region. Hence, there is a need for an effective central government in Iraq; one that incorporates all ethnic and religious groups. And all countries of the region are called upon to take action against the terrorists, and to stop any kind of support for them. This conflict makes it clear that understanding between cultures, religions – and even religious denominations – is an essential requirement for peace. Those who stir up hatred for other religions act without responsibility, and undermine peaceful co-existence in our societies. This endangers development, stability and economic prosperity. We must therefore emphasize our shared values, those which unite us. We all want to live in an atmosphere of peace, justice and tolerance. This should be underlined, especially to an organization that primarily represents economic interests – because economic exchange and prosperity can only thrive on a basis of peace and stability. Hence, building bridges between cultures and religions is our shared responsibility. We must all make a contribution to ensure that Europe and the Near and Middle East region become places in which people of different cultures and religions can live together in peace.